We’ve reviewed over 100 different Bespoke Post boxes over the years! Bespoke Post ($45/month) is a high-quality men’s subscription box service that gives you a “mini lifestyle upgrade” in each box. Each month they curate several new boxes around a theme, and you can select which one you want from new or past boxes– or skip that month. It’s one of our favorite men’s subscriptions and one we gift regularly to others! Read our detailed unboxings & reviews below to see inside this popular subscription box for men and find out how other subscribers rate this box. What is Bespoke Post and how does it work? Bespoke Post is a subscription box geared towards men. Unlike some subscription boxes that are a complete mystery, Bespoke Post members can see a variety of themed boxes each month and can choose which one they want to receive (or skip a month if they choose). Themes are around a variety of lifestyle categories and include food and drink, fashion, products for the home, and more– so there's almost always something for everyone! How much does Bespoke Post cost? Bespoke Post is $45 a month for members, or you can buy a single box for $55 without a membership. 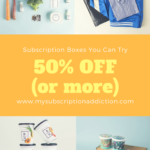 Use our exclusive coupon code ADDICT25 to save 25% off your first box! What types of items usually come in Bespoke Post? One of the best things about Bespoke Post is that you can pick exactly which box you want to get every month from the boxes they have available. Their boxes usually feature high-end and indie brands; they really are like a "mini lifestyle upgrade" in a box. Themes include boxes featuring clothing (think: items like luxury hoodies and flannels), office and home goods (think: concrete desk accessories and leather portfolios), and food and drink (think: a chili kit including crockpot, a box focused on whiskey tasting). Check out our reviews above to see in-depth examples! Is Bespoke Post worth it? At $45/month, this subscription isn't exactly cheap. But in terms of overall value, since you get to choose the exact box you want to receive every month, there is very little risk that you'll get something that you don't want! The retail value of the boxes does vary since the contents can be so different from box to box, but most are at least valued at $85+ (with some over $100). Is Bespoke Post just for guys? Definitely not! While it's a great gift for the men in your life, there are plenty of women that appreciate this subscription too (especially if they love minimal and rustic style and unique, high-end items that might be hard to find elsewhere). How do I cancel Bespoke Post? You must call or e-mail Bespoke Post in order to cancel your subscription. However, you can skip a month online from within your account. How do I sign up for Bespoke Post? "So are most FabFitFun boxes. The cost of this box is nearly an annual FabFitFun sub. Although FFF doesn't send o..."